Based on the original "Vetiver" by Carven from 1957. There are 4 reviews of Le Vetiver. This is a very earthy and green fragrance while being boozy at the same time. From what I smell I get vetiver and an alcoholic drink vibe which is what I assume is gin and absinthe - drinks made from juniper berries and the artimesia plant respectively. I also detect a hint of patchouli making it darker in nature overall. The main note however is vetiver and booze. As it dries down it becomes more bitter and green, but in a good way. The vetiver in this is very bitter and green, but not soapy (i.e. in Creed's Original Vetiver or Mugler Cologne) or dirty/dark (i.e. in Encre Noire). It gives me similar vibes to Ralph Lauren Polo Green or Quorum by Antonio Puig but without the pine, tobacco, or leather notes if that makes sense. The fragrance is masculine but I feel certain women could pull it off. The overarching scent of it reminds me of a medieval forest mixed with forest-based spirits; it kind of smells like what a witch in the 17th century would smell like perhaps. It certainly gives off an aura of mystique. Sillage is moderate but leaning strong - in fact I got wafts of it with a very small spritz on my arm - while longevity is moderate (about 4 hours). One problem is that the sprayer is absolutely horrible and can be broken really easily when taking the cap off. Overall however this is a really nice vetiver fragrance that smells like you're drunk in a forest somewhere (oddly, that smells pretty good). P.S. the sprayer is easily broken by removing the cap too quickly, so be careful. It's not like Carven Vetiver . 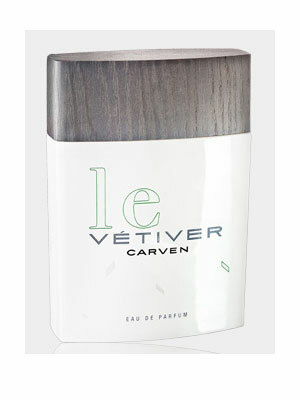 Carven vetiver it's more hot ,more nice. If you want a scent for every days to worke is good LeVetiver. But if you want more....Carven Vetiver make for you. I hardly get any vetiver in this. It primarily comes across as a fresh-green masculine, soapy and a somewhat synthetic vibe. The synthetic element disappears completely at around three hours, which is the same time when the cash runs out. Stylistically it is somewhere between Creed's Original Vetiver and Lubin's Itasca. Mugler Cologne, Guerlain Vetiver and Lubin's Itasca would be much more compelling alternatives. A sharp, somewhat herbal green, citrus opening that reads as cool-spicy to my nose kicks things off, with just a touch of sweetness to smooth things out. Well done and smooth, maybe a tiny bit synthetic here...but in an intentional and modern way. I get where others are coming from with the old school vibes. The surprising reference that came to mind for the first 30 minutes or so was a modern take on Creed Vetiver '48 (love! ), and I wonder if there's some ginger hidden in there. A short aromatic phase (a very dry lavender) follows, and feels like we're heading in a fougere-ish direction, which may account for the Rive Gauche references, but then it swerves quickly to becoming a pretty dry, surprisingly smoky, woody, pure vetiver to my nose. The closest analog to me is actually Sycomore, or maybe a less intense Encre Noir (which is basically what Sycomore is to me), with a slight spicy barbershop flair. Nothing wild, but purely enjoyable, high quality, uplifting versatility. There are no member images of Le Vetiver yet. Why not be the first? Carven Le Vetiver or tuscany by aramis?? ?